When it comes to fashion, consumers have lot of options. Textile companies and fashion houses are coming up with innovative ideas that offer better styling and comfort. One such brand, leading innovation in fashion is Versatyl. in 4 different ways, essentially, ensuring that you get 4 unique, colourful T-shirts all wrapped in one amazing package. As the world moves online, it’s only natural we want to conduct an increasing number of our shopping activities over the internet. While we don’t seem to think twice before ordering shoes and clothes online, why do we exercise a generous dose of caution when thinking of buying jewellery online? It’s true that some of us are still sceptical of buying high-value items over the internet. However, with brands gaining trust in the market, there is no reason to avoid buying jewellery online. Not only do you get the chance to browse through and compare a variety of items online, but you also get the benefit of paying lower prices when you shop from trusted jewellery experts. London, Oct 14 : Downton Abbey's costume designer Caroline McCall has made a chocolate dress by using nine stone of milk, dark and white chocolate. The gown, which is strapless with a fitted bodice and elegant tulip-shaped skirt made from leaves in varying shades of brown, pale green and chestnut, is made from more than 60kg of Lindt Excellence chocolate, Metro. co. uk reported. 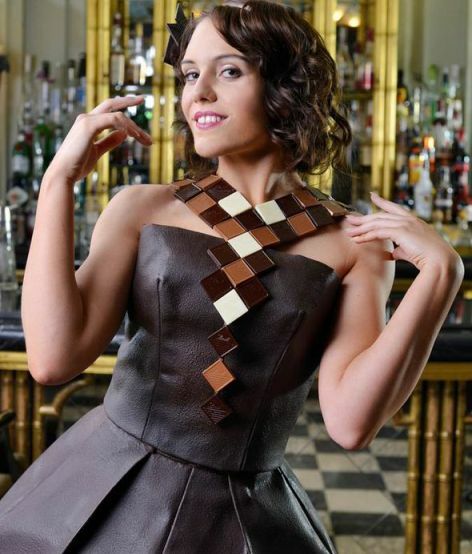 McCall created a template of the handcrafted "Deco Diamond" dress using material and then food artist Paul Wayne Gregory recreated parts of the gown in chocolate and sprayed other parts with the chocolate, coating the entire thing in the sweet stuff. London, March 8 : Skirts have been given an edge for 2014 with asymmetrical hemlines, which are not only making waves at fashion runways but also as part of high street fashion. Asymmetrical skirts were seen as a part of the spring-summer 2014 collection of Christian Dior, Nicole Miller and Marissa Webb, reports femalefirst. co. uk. But make sure you make the right choice while picking your piece. Make sure there is plenty of contrast between the skirt and skin tone of leg, whether you wear a pair of tights or not because the focus will be on the hemline. New Delhi, Feb 18 : Jewellery designer Alpana Gujral's new collection titled Spring 2014, a revival of the Mughal era with a contemporary touch, will be exhibited here for two days from March 3. Spring 2014 will be presented at her store in Lajpat Nagar here, said a statement. The line offers necklaces, cuffs and earrings made of pearls, ruby, gold, tourmaline, black onyx and diamond, and Gujral believes the designs will offer spiritual depth for the wearer. New Delhi, Jan 22 : Bollywood stars never fail to set style trends. Shahid Kapur's straight shag cut and Saif Ali Khan's slick combed back look are some of the hottest trends of the season, according to hairstylist and entrepreneur Rishi Gupta. Easy to achieve and simple to maintain, try out the following hair styles in 2014, suggests Delhi-based Gupta, who is the managing director and founder of Trendz group of salons. Bangalore, Nov 26 : Italian hairdresser Rossano Ferretti, who has styled for the likes of Angeline Jolie, Lady Gaga and Salma Hayek, is set to make his third visit to India next month to launch his third salon in the country. Ferretti will launch the much awaited 'Rossano Ferretti Salon’ at The Ritz-Carlton here Dec 4, said a statement. The stylist already has two salons in India - one at the Four Seasons Hotel in Mumbai and another at The Oberoi in Gurgaon. New Delhi, Oct 14 : As the temperature gradually dips, emblazon your winter outfits with leopard prints and wear them with chic accessories, says an expert. Nidhi Gupta, head of fashion brand BYSI India, says most women want clothes that make them look younger and slimmer, but styling should be enjoyable too. “Pick different items and create your own look, then use the trends to enhance it. Not all items have to be in harmony when you're mixing and matching. In fact, the piece that seems out of place can be very chic,” Gupta said in a statement. New Delhi, Sep 27 : From fusion to bright colours, try different styles to make your wardrobe more interesting. - Try a button front shirt with rolled sleeves for a casual look. - Go for any short western dress, but with an Indian touch like embroidery work on it. - Wear kurtis with different kinds of bottoms like patiala salwar, churidar or even leggings. New Delhi, Sep 24 : Many think straight hair is boring, but the runway trend reflects the opposite. An expert says straight hair is enviable. Leave it long and loose or tie it up in a ponytail, straight hair is easy to maintain. "To those who don't have it, straight hair is enviable - it rarely frizzes, beautifully reflects light and is so simple to style," Anthea Rodriques, Brand Ambassador, Schwarzkopf Professional India, said in a statement. New Delhi, Sep 20 : Pernia Qureshi's debut book "Be Stylish with Pernia Qureshi" will not only be a guide on understanding and honing one's personal style, but will also reflect the writer's journey to becoming a full-blown stylist from an "overdressed toddler". Random House Publishing India is set to launch the book, which will give handy tips on the Do's and Don'ts for individual body types and personalities, allowing people to embrace their character and create their own "signature look". New York, Sep 10 : Fashion apparel brand Tommy Hilfiger’s women’s spring-summer 2014 collection is colourful and sports-inspired. The collection was presented at the New York Fashion Week here Monday. “It’s Melrose to Malibu. The West Coast represents a golden era of surf, sport, and optimism,” Tommy Hilfiger, founder of the lifestyle brand Tommy Hilfiger Group, said in a statement. Mumbai, Sep 5 : Jewellery designer Varuna D. Jani's special diamond range for the new age bride has bold opulent pieces, cocktail rings, chandelier earrings and unique designs studded with semi-precious stones. The line aims to pay tribute to the modern bride. "Indian brides are no more demure and shy; they are the evolved Indian brides who make informed choices. Our collection is a tribute to new age bride who are individuals and trendsetters. They are the real showstoppers," Jani said in a statement. New Delhi, Sep 4 : As many as 37 Indian designers have created 37 exclusive classic black clutches in their signature style - all for a cause. The sales proceeds of these products will go to charitable organisation Habitat for Humanity India. The initiative, The Black Clutch Project, is a joint initiative by multinational financial services corporation American Express and fashion and lifestyle magazine Vogue for their global luxury fashion extravaganza - Fashion's Night Out (FNO). The event will happen Thursday at Tote on the Turf in Mahalaxmi, Mumbai. New Delhi, Aug 12 : Move over gold and diamond jewellery. Try beautiful floral jewellery for your pre-wedding functions. Ferns N Petals (FNP), a leading floral and gifting brand, has launched an exclusive range of contemporary floral jewellery. Made with fresh flowers in innovative designs, the new range is an innovative subsidiary to heavy jewellery. It also adds a fun element to the overall dressing. London, July 15 : Sport the metallic look for your next party. From silver to bronze, there are plenty of metallic eye colours for you to experiment with. Bourjois, Bobbi Brown and Guerlain are some of the brands one can try out, reports femalefirst. co. uk. Metallic eyes can be carried off with bright coloured clothes or even white. You can go for silver eyes with black eyeliner or golden smokey eyes. New Delhi, July 8 : Getting ready for a casual evening or a corporate event - try bright and bold lip colours that go well with casual, corporate or ethnic wears. Makeup artist Niti Luthra says neon colours like hot pinks, corals, red, orange are very much in trend. "Neon shades are perfect for monsoon. Shades like corals, hot pinks and ruby red work well with every outfit. But avoid gloss, as it makes the look stickier," said Luthra. Luthra feels a woman should be aware of the best ways to apply a lip colour as it can make or ruin the looks. Kolkata, July 4 : Get gorgeous and adventurous with trendy nail art this rainy season. Zebra stripes, polka dots and floral designs are in vogue. "You can start off simply and then move on to more adventurous patterns. It really helps that nowadays you have a wide variety of patterns, textures and types of nail polish to choose from," said city designer Farheen Bushra Rahman during a nail art demonstration while unveiling her brand Fbr. Inc. Wednesday here. Ranging from sheer, pearl, metallic and chunky glittered, nail paints can be further accentuated with stick-on glitters and stencilled patterns. New Delhi, June 26 : Expo Riva Schuh India, a platform showcasing a range of footwear and leather accessories, is back with its third edition. To be held here July 4, it will feature works of over 200 global leather product-makers. The three-day exhibition will take place at the Pragati Maidan Exhibition Centre. The fair is organised by Riva del Garda Fierecongressi and Italian Exposition Pvt. Ltd. (IEPL) in cooperation with Council of Leather Exports (CLE), India Trade Promotion Organisation ( ITPO) and ICE - Italian Trade Commission, Trade Promotion Section of the Italian Embassy.